Some time ago I had a loss of faith. My soul was longing to reconnect with the spirit of the world and I felt estranged from my spirit guides and their guidance. I found myself wishing for clarity and in need of signs. So for the first time in a long time I meditated with my crystals, feeling sure that I would have to pay for my lack of diligence and be forced to work really hard to get back into the zone, but I was lucky, my body relaxed and my mind free-fell into that dizziness that signified ‘the zone’. I could smell the pines and nature and slowly my eyes became clear as if I had washed a window and watched it dry. Suddenly my feet felt snow and a cool breeze fell upon me while ahead of me was a bear, a large brown bear. The bear appeared non-threatening, like a friend. It looked at me from over its sizeable shoulders and rump with what appeared to be a smile on its face. Then it turned around and walked toward the edge of a forest while standing up on its hind legs. 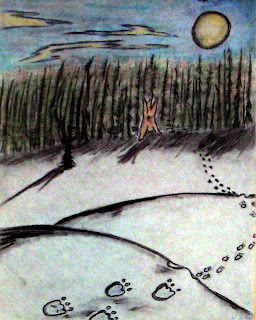 It raised its paws at the large full moon that had lit its path against the snow and then slowly made it’s way into the woods. It seemed to be saying, "Come see me any time…I'll be watching you” and somehow I was comforted by this. This image has stuck with me because it was the first time I had seen my spirit guide as a bear. While mulling over this image the artist in me finally came out and I made a charcoal and watercolor drawing of the bear that always brings me peace and I realized that I needed a good name for this drawing, not just “The Bear” so off I went to look up synonyms for the word ‘bear.’ This is when I realized that Ursa was the name for bear. When my parents were first married they had a child by the name of Ursula and she passed away within a few hours of being born. Now when I meditate I feel a kinship with this sister I never knew as if she's right here with me. Well my real name is Cathy but I like to write under "Cappy Sue". I am thirty-one and married to a lovely man and I am a mama to a house full of furry babies. My dreams keep me up most nights and often become stories or paintings. I truly believe that we all make choices, but that some things are pre-destined, and that if we keep our ears open and listen, there is always a divine voice whispering and offering us help along the way. To read more metaphysical articles by Guest Writers please go here.